THE FARM FRESH Rhode Island food hub is seeking about $2.2 million in state Rebuild Rhode Island tax credits. / COURTESY CITY OF PROVIDENCE. PROVIDENCE – A $15.5 million project by Farm Fresh Rhode Island to create a food hub and permanent indoor farmer’s market in a newly constructed building is seeking $2.2 million in state development incentives. The project, called the Farm Fresh Rhode Island Food Hub, involves a new building of some 61,500 square feet at 498 Kinsley Ave. 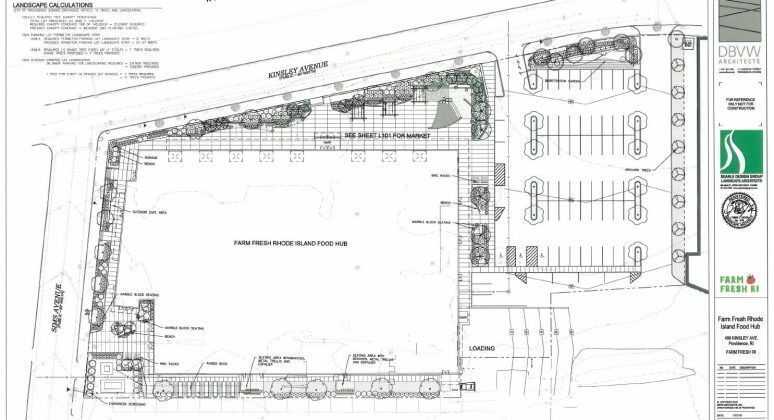 The food hub would include distribution space, a commercial prep kitchen, a farmer’s market and commercial space, according to the plans filed with the city of Providence. The R.I. Commerce Corp., in its meeting Tuesday, is expected to consider whether to authorize $2.2 million in Rebuild Rhode Island tax credits, to help facilitate the project’s financing. Commerce RI’s finance committee has recommended the approval. The food hub has already received financial support from individual, corporate and philanthropic donors, the city of Providence and the state. The R.I. Department of Environmental Management in 2018 contributed nearly $500,000 to the project, which will include space for the Farm Fresh RI Harvest Kitchen, a culinary arts training and production center that works with unemployed, young Rhode Islanders. The project also has received initial funding from the Providence Business Loan Fund, which allowed it to purchase its 3-acre site.